Balancing the vehicle properties in order for them to match their role on the battlefield without becoming too strong or too weak is a delicate process that requires finesse because the goal is not to simply produce vehicles that are balanced, but also, and perhaps more importantly, diverse. Battlefield diversity is one of the key elements of the entire balancing process. To put it simply, if all – for example – Main Battle Tanks were the same, the class would be perfectly balanced, but also very boring to play. Our approach is to introduce a number of unique elements to many vehicles that make them very special. Some of them are obvious at first glance – for example, the acceleration active ability for the Chinese Main Battle Tanks, others are not (improved ammunition racks for the Challenger), but these too influence the gameplay a lot. When determining the performance of each vehicle (how “balanced” it is), we are using a complex analytic method that uses more than one hundred parameters, ranging from the most obvious ones (damage taken, damage dealt) to those not as obvious (the distance each vehicle travels in battle for example). 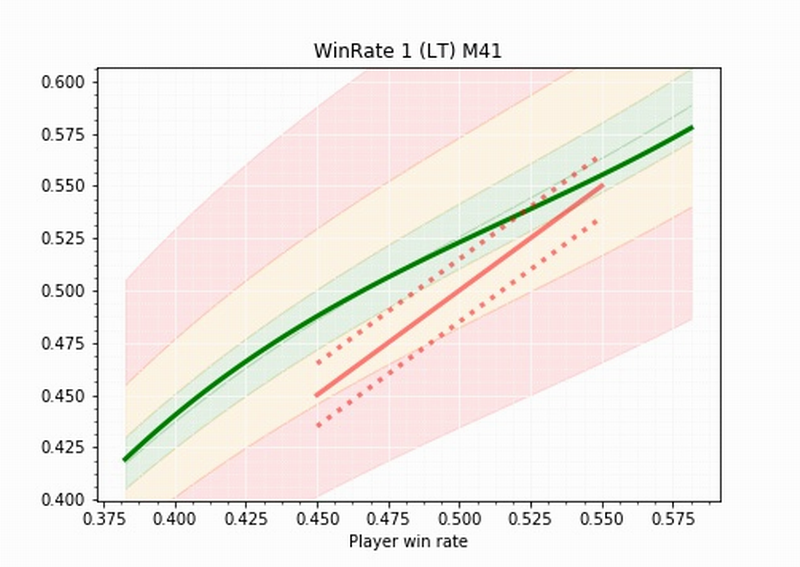 The best known of these parameters is, naturally, the winrate – the percentage of victories in the overall amount of battles played, separated by modes. Since the players are familiar with this parameter, we’ll use it to demonstrate how we approach all parameters. The shape of the winrate curve is an indicator that the vehicle is going fine – or not. If the curve enters the yellow and red fields, this is the first (and the most basic) alarm that there is something wrong with the vehicle. If that happens, a thorough analysis takes place to determine what the cause of the problem is, but it’s worth noting that a deviation from the ideal curve (which runs through the center of the green zone) does not tell us what is wrong with the vehicle – it’s merely an indicator. The deeper we delve into the intricacies of vehicle balance, the less intuitive some issues and changes become. One example would be a popularity of a vehicle – the higher the popularity, the lower its average winrate. However, excessive popularity can also be a good initial indicator of a broken vehicle – as a result, a potentially overpowered vehicle might have an acceptable average winrate (which is why we compare the results to player winrate). In some extreme cases, buffing a certain property of an already well performing vehicle might, in fact, reduce its winrate – for example, if a brawler tank (like the Soviet MBTs) receives a buff to a property that makes it more comfortable to fight with at close distances, its users become more confident and start deploying it in riskier situation. This generally gives us an idea regarding where to look for issues as we dig deeper into the vehicle’s performance. But there’s two more elements to the entire balance equation – there are also the game modes. When looking at vehicle performance, we take a look at how it performs in all three modes and balance the vehicle accordingly. Our goal is to make sure that each vehicle performs in each mode in an acceptable manner. The word “acceptable” is the key here – it does not mean that the vehicle should have perfectly balanced winrate at the same time in all three modes. There are vehicles that perform well in PvP but are not really all that good in PvE (typically various fragile vehicles) or vice versa (typically “damage sponges” like the Challenger series). Our goal is not to make these vehicles perform well in all modes, but to make sure that they are not completely unusable in one mode. And last but not least, there is the third element – the player feedback. Contrary to popular belief, we actually take feedback very seriously. When taking a look at player reactions, we are aggregating the feedback from multiple sources (including the forums, the opinions of closed player focus test groups and social media) – what interests us the most are the general opinions on certain vehicles, such as “this tank is boring” or “I am having a hard time playing this vehicle” – such feedback is a good start for an investigation into vehicle’s performance and often results in balance changes. Other good source of feedback are proposed features that the players would like to see on specific vehicles or even which vehicles to introduce next (but that is a topic for another time). As an example of this approach, we will be returning the 20mm automatic cannon to the VBL TOW – players will get to choose which weapon system to use.